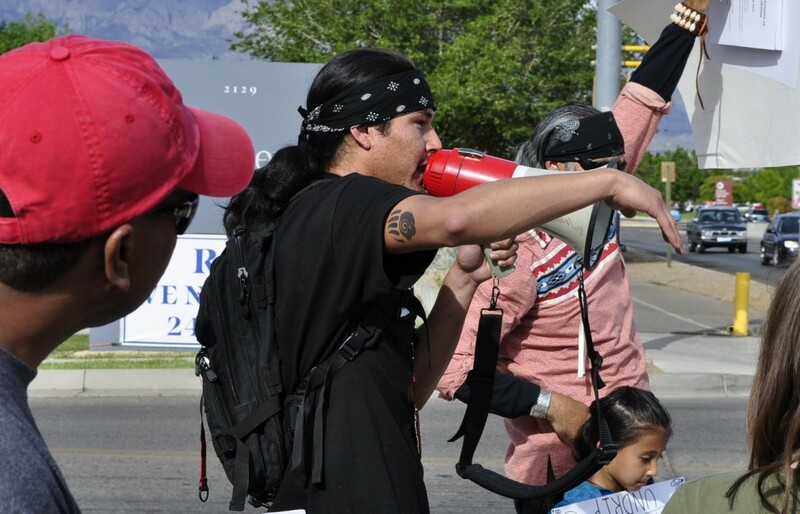 Cooper Curley (Diné, Gallup, N.M.) speaks at a May 10 protest against the proposed Roca Honda uranium mine. Albuquerque, N.M. — More than 30 protesters gathered in front of the Cibola National Forest Supervisor’s Office in Albuquerque on Friday to demonstrate against the planned Roca Honda uranium mine near Mt. Taylor, a peak held sacred by several Native tribes. Inside, U.S. Forest Service officials acknowledged the mine will have “significant” impacts on archeological sites and traditional Native activities, but said there is little their agency can do, other than attempt to mitigate the damage. The 1872 federal mining law “says we have to allow mining to occur,” agency spokeswoman Ruth Sutton said. “If Natives had the money to come to Mount Fuji and mine it, how’d they like it?” asked Joseph Ray (Laguna Pueblo). While the government cannot halt development of the mine, one of the draft assessment’s alternatives would reduce surface disturbance by about a third, noted Forest Service Zone Geologist Diane Nowlin Tafoya of Albuquerque. “They proposed two shafts (but) we created alternative No. 3 – a one-shaft alternative,” she noted. The assessment’s first alternative is a no-action or no-mining option that the Forest Service cannot legally select, she noted. The second of the assessment’s three alternative actions represents the mine developers’ proposal. There are no currently-active uranium mines in New Mexico, and the nation’s only operating uranium mill is in Blanding, Utah, Tafoya said. Uranium ore from the Roca Honda mine would be trucked to Utah for milling. Water from the mining operations would not be injected back into the aquifer, but would instead be stored onsite in a tank at the Lee Ranch for irrigation, or released into San Lucas Arroyo, Tafoya said. “Continuous” monitoring of water quality would be conducted on site by the mining company and reported to the Forest Service, she said. But Natives participating in the demonstration outside were skeptical about such reassurances. Joseph Ray said he was worried that springs and ground water in the area could become contaminated by mining operations. The proposed mine will “desecrate our sacred mountain,” Rondon said. Due to high demand, the Forest Service will reopen the public comment period for the mine project, to extend from May 14 to June 13. For more information on submitting public comment, contact Forest Service Zone Geologist Diane Nowlin Tafoya at dtafoya@fs.fed.us or at (505) 346-3809. This article has been updated to clarify that the proposed mine water storage tank would be located on Lee Ranch, not at the mine site, as was stated in an earlier version of this story. The Navajo Nation has named its first ever Poet Laureate. A poet, professor, and storyteller, Luci Tapahonso talks with New Mexico In Depth about language, beauty, and history.